So many apps go to Apple for approval everyday. We’re lucky that the truly awful ones never make it on the store. Most that are approved have some redeeming feature, but it’s rare that one deserves acclaim. And it’s even rarer that one modeled after classic arcade brickbreaker games brings something truly amazing to the genre. 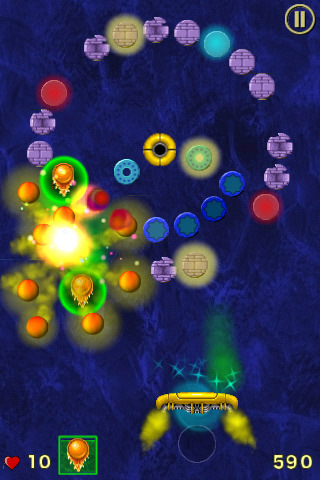 Fans of Breakout and Arkanoid, this one’s for you: Code Freeze’s brickbreaker game, Jet Ball, is a true gem all-around. Jet Ball is a brickbreaker fan’s dream come true. There are 65 different moving levels packaged into 13 larger group levels. You’ll need to beat each sublevel in order to unlock the next larger group level. And if you do beat out all 65 levels on easy, you can try again on the normal and hard difficulty levels. This game affords countless hours of fun. Playing is very intuitive and the instructions that show up at the beginning tell you everything you’ll have to do to last as long as possible in the game. Collect and avoid over 20 different power-ups and power-downs while breaking down a cornucopia of different obstacles. Playing is very easy. Like most brickbreaker games, all you have to do is lightly press and hold the area below the pad with your finger and move side-to-side to make the pad move. Easy, peasy right? Yes, it’s child’s play but that’s where the easiness ends because the game becomes a matter of how long you can last. Controls are solid. If you need a break from blasting, melting, and exploding bricks, you can exit the game and it will automatically save. Coming back to it later or starting a new game is a breeze. There’s even integration with OpenFeint so you can compare your score with others, unlock achievements (who doesn’t love a good achievement to brag about? ), and challenge friends (this is where the bragging comes in). Controls are great, but they could be even better if developers added a feature that allowed users to touch anywhere on the screen to control the pad. This way, developers could reposition the pad lower and create more room for additional blocks or enhanced graphic details. Not that the graphics need more detail. It certainly wouldn’t hurt, but the dozens of surprisingly beautiful, decorated blocks already fill the need. Boring, monochromatic squares they are not. There are various, patterned blocks that each offer a different challenge for the player. I think that you will become a fan of the lovely glowing green power-ups too. Yes, Jet Ball is going on the first page of my iPod Touch. I’ll enjoy the fantastic app while playing my iPod Touch music in the background. Hopefully you’ll join in on the fun. For about the cost of a song download, $0.99, Jet Ball is a steal. If developers could add even more levels and power-ups and power-downs with future updates, I’d be in happy gaming bliss. If you’re in doubt, try before you buy with Jet Ball Free. This lite version lets you test out 10 different levels before you commit to buy. AppSafari review of Jet Ball was written by Linda Ta on April 21st, 2010 and categorized under App Store, Featured, Fun, Games, Puzzler. Page viewed 7982 times, 2 so far today. Need help on using these apps? Please read the Help Page.